Thanks for thinking I'm interesting enough to check up on. If you've come this far, I dare you to say hello before you leave. NEW: Thanks to the ACLU, I'm suing the Attorney General of the United States. Two new motions were filed in March 2019. Read an older summary of the case. 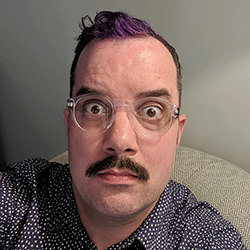 I am the Director of ESC: the Center for Ethics, Society, and Computing as well as the H. Marshall McLuhan Collegiate Professor of Digital Media at the University of Michigan. At Michigan I teach in both the School of Information and the Department of Communication Studies. I am a member of the Center for Political Studies at the Institute for Social Research. I am also in Art & Design; Science, Technology, & Society; and Digital Studies.